California has long been synonymous with a healthy living and great food. If it’s local, organic and hand made the Californians will embrace it wholeheartedly. 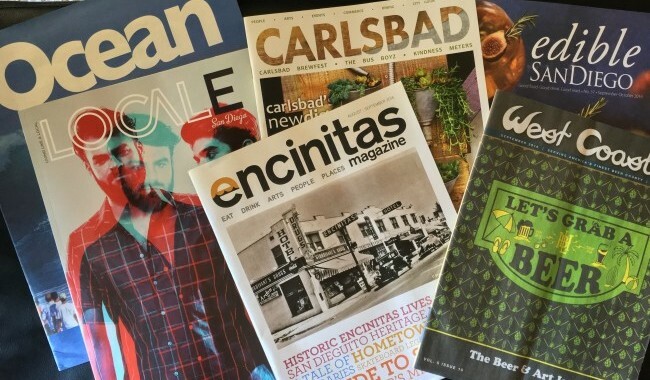 But forget the big cities – the ‘burbs is where great food is happening, and none more so that the exploding and vibrant foodie culture in North County San Diego (North County for short) in Southern California. 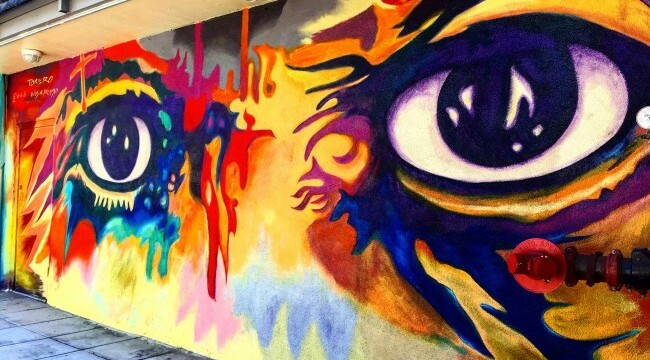 I have visited “SoCal” a few times now and in this article I am letting you in on a little pocket of foodie heaven that is far from the maddening tourist crowds. Let me take you on a little culinary tour of North County! O’side is a big surfer town with epic waves and the longest pier in California. It’s undergoing something of a renaissance at the moment and is certainly the edgiest and coolest of the towns on this strip. The food scene is leading the way in drawing people into the town and showcasing what it now has to offer. 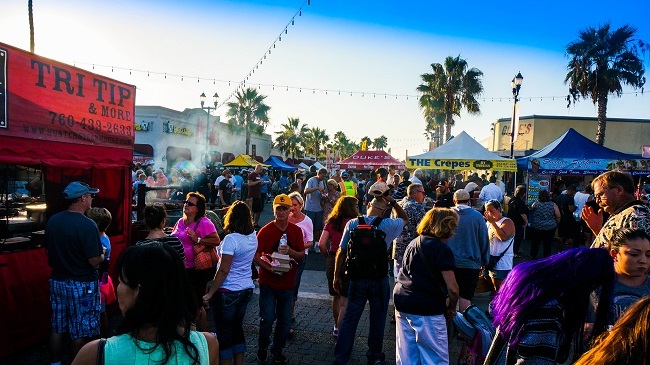 Every Thursday is farmer’s market day in O’Side and you have a choice of two! The vibrant day market hosts a mix of food vendors alongside hand crafts and natural organic skincare. Else, catch the night market where people hang out, eat great street food before heading into one of the towns many craft beer houses. Part bakery/patisserie/excellent brunch hang out spot, Petit Madeline is an unassuming place with excellent provenance. The owner was trained by none other than Alice Waters of Chez Panisse, and the quality of the food on offer shows through. We fell in love with an almond cookie with boysenberry puree, cream parfait, bruléed boysenberry, and chocolate sauce all encased in tempered dark chocolate. Dreamy. A concept restaurant where diners are encouraged to share their food. Headed up by a young, ambitious chef this place is all about the quality of the ingredients. 100% grass fed burger in hand made buns and lobster tacos: all the flavours are clean, fresh and uncomplicated letting the quality shine through. A creative selection of freshly pressed mixed juices with free refills are just the thing to revive the pallet between mouthfuls. 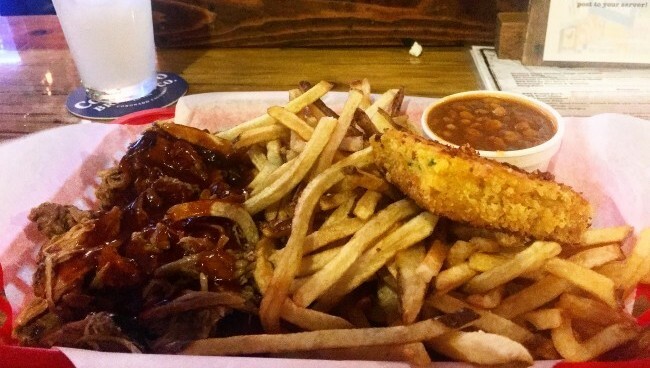 A Louisiana BBQ Smokehouse in the middle of SoCal that rocks! A huge pitsmoker sits out the back of this relaxed bar/restaurant: 24 hours a day, 7 days a week slow cooking enormous hunks of meat over apple and cherry wood for a sweet smoky hit of bliss. Pulled pork, ribs, jalapeno corn bread, skin on fries and collard greens – definite highlights from a hard-to-choose-from menu. Go in starving and roll yourself out. A serve yourself craft beer bar. Sign up for a wrist band that is pre-authorised with your credit card; choose from any of the 49 craft beers or 10 wines available on tap for self-service! 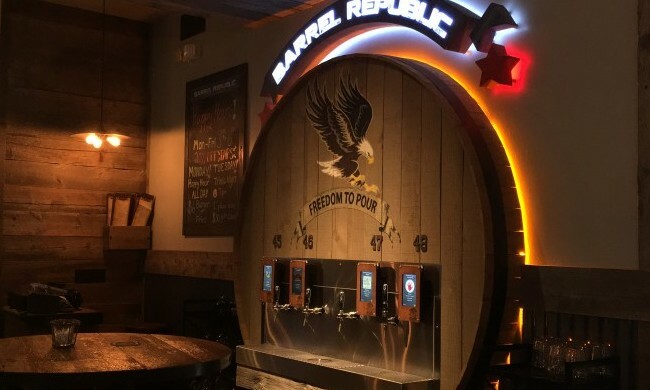 Beer is charged by the ounce and you settle your bill when you hand in your wristband. A selection of beer from all over the world means there is something for everyone. Some interesting eats are available here too. We went with the simple mac and cheese and spiced it up with some fresh ground jalapeno pepper dust and slow cooked bell peppers. Perfect with your beer! We signed up for an easy-going Sunday afternoon food tour of O’side with Linda. There are number of different tours that run on different days. Check them out online and book in. Tour price includes all food and water, drinks are extra. 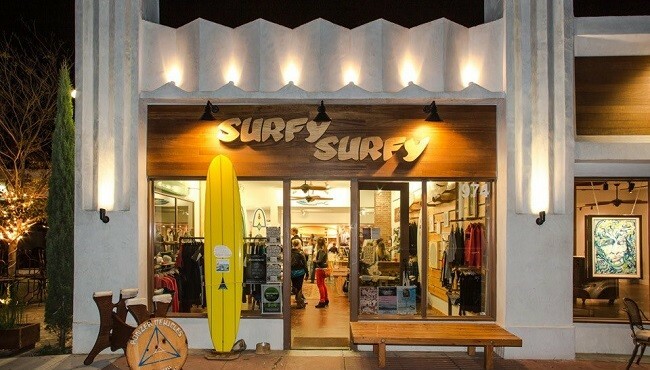 Best non-foodie thing to do: Hang out with the horizontal guys in Surfy Surfy. OK, so that’s four words, but let me explain. We like to surf as well as eat and we’ve been following Surfy Surfy on Twitter for years, so the last time we were in SoCal we sought them out. They had just opened a coffee shop next door and called it Coffee Coffee. Surfers like coffee a lot, so it actually makes a lot of sense. Plus the coffee is awesome (still, four years later). As is Surfy Surfy. Yeah, it’s a shop and yeah I guess they’d really like it if you bought something, but really all they wanna do is either surf or talk about surfing, or where they have traveled to surf. Leucadia has some great fish restaurants, Fish 101 would be one to mention in particular. But really, for us, Leucadia equals surf talk and excellent coffee. Let’s move on! Best non-foodie thing to do: Go shopping – there are some excellent independent shops here that support local arts and crafts. Encinitas captures the laid-backness of Cardiff with the buzz of O’side: in short you get the best of both worlds here. 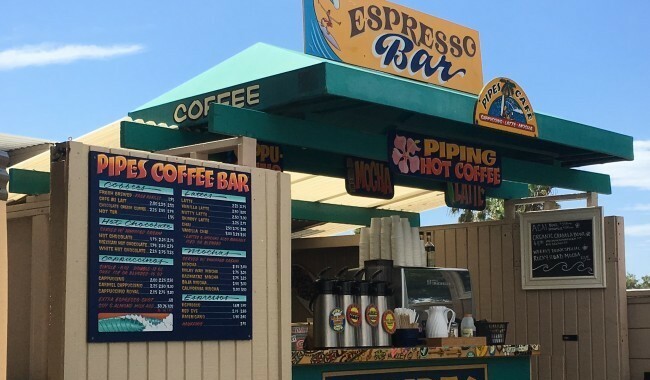 Encinitas is jam-packed with great places to eat and drink: simply too many to mention here, so if they have made it onto our list, trust me – they are worth seeking out! It’s not every day you see queues of people lining down the street waiting for an ice cream. Locals queuing for something is a sign not to be ignored. You simply need to join that queue and find out for yourself. A vast blackboard with a dizzying variety of ice cream flavours made daily fresh on site and changing with the seasons. We tried Orange Sherbet, Key Lime Pie and Salted Caramel Truffle. I think, possibly, the best ice cream I have ever tasted. 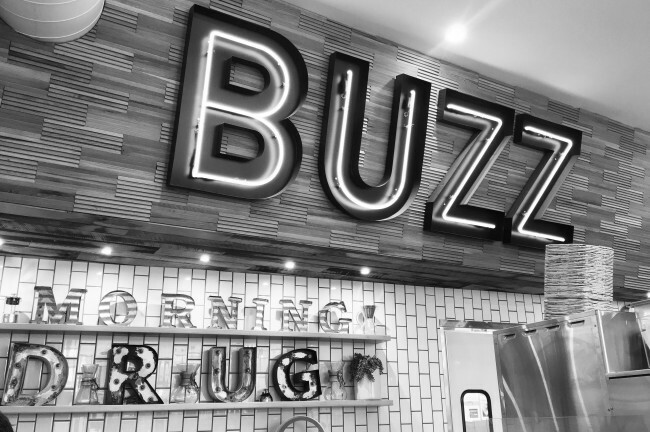 Firmly in the “so trendy it hurts” category, Better Buzz is wall to wall table hogging freelancers; apple macs as far as the eye can see and oversized cabaret lettering on the walls. Choose from any kind of coffee imaginable, including a variety of cold brews on tap. Service is slow for a coffee shop, but then perfection can’t be rushed. Initially I had gone for the audacious-sounding “Best Coffee Ever” spiked with vanilla and MAGIC (literally, this is what the menu says). The coffee was great if not a little too sweet from the vanilla. The latte though was pure perfection with a luxurious crema. You know when your coffee is ready when they announce your name, and tell you that “you’ve been buzzed”. And quite right they are too. This tiny little Maine-style lobster diner is the stuff dreams are made of. A simple menu of lobster, crab or scallop rolls; lobster bisque or classic clam chowder is heartening. The interior is just on the right side of “nautical” to still be classy, the staff friendly and there are lobster claw shaped salt and pepper pots of the table. Sold. The Lobster Roll is filled to overflowing with fresh lobster simply poached nestled in a grilled and buttered roll and topped with their secret seasoning (we tasted white pepper, garlic salt and oregano), served with a side of apple slaw and a bag of salted chips. Absolute perfection. 200 craft beers are available here either on tap or bottled with a daily changing specials menu too. 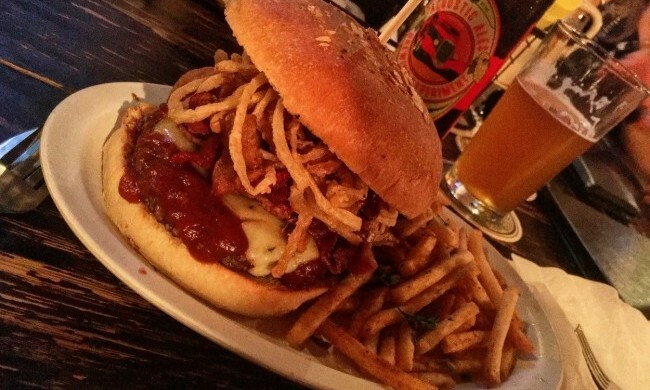 Part dive bar, part awesome burger joint this is the place to go for your ultimate burger/beer/sports combo. The staff are well up on their beer game and can talk knowledgeably to you about any beer on offer. Beers are not cheap here: a simple German Pilsner starts at $7 and it goes up from there, but the quality of what’s on offer is really very good. As far as the food menu goes, just skip straight to the burgers and watch out for the specials board. We tried the 100% grass fed New Zealand Kobe beef burger and an Elk Burger with sweet ‘tater fries. Cooked just how you want it and melt in the mouth satisfaction. In Cardiff, everything centres round the beach whether it’s surfing, running or spending family time. And they love great food! Half way between Encinitas and Cardiff across from Swami’s Beach – one of the most famous surf spots in California. Famous for their “Acai Smoothie Bowls” this place is always busy all day long. I became addicted to their Peanut Butter Ice Cream Smoothie (my name is Kate and I am a PB Smoothie addict), and their blueberry buttermilk pancakes which were the size of dinner plates slathered in maple syrup. There are lots of reasons to visit this superb supermarket, but mainly visit for what is known locally as “Cardiff Crack”. 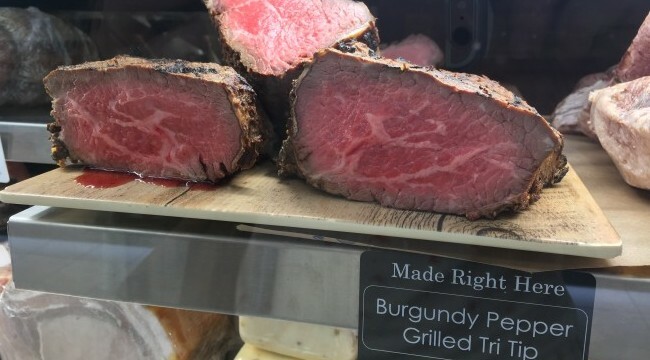 A dry-aged tri-tip steak that is marinated in a secret blend of spices and cooked medium rare. Stick it in between two slices of house-made sourdough – simple. It’s called Cardiff Crack because of its highly addictive flavour, and I’d agree. It can only be gotten at Seaside Market and you cannot visit Cardiff without tasting the Tri Tip Sandwich. Wine merchant, wine bar, casual dining and wine tasting all under one roof, with a glorious view of the ocean and a prime view of the sunset every day. Great wines sourced from all over the world, heavy on the Californian’s obviously! Great food – especially the pizza. A Cardiff institution for breakfast and brunch, especially amongst the surfers looking for something hearty after an early morning surf. Open from 7am – 3pm every day, huge breakfast portions that will see you through to evening – especially the breakfast burritos. Free coffee and ice-coffee refills, plus an espresso hut outside for those in a rush. VG for “Very Good” donuts, this place is a must-visit. Freshly made doughnuts every day in lots of flavours finishes and topping; plus pastries, muffins, bakes and cakes. Queues move fast and donuts are about $1 each. 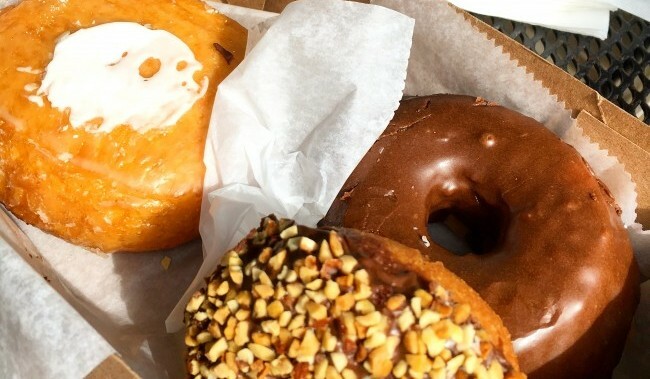 Fill up a box and indulge for breakfast. This close to being down Mexico way, you would expect excellent Mexican fayre and you can find it in these two places. Lordes is a cantina serving up home-style Mexican food including fresh tacos in hard or soft shell with chicken, beef or pork; served up with Mexican rice and refried beans. A salsa station lets you choose from four different salsas and a pickle. Free soda refills. 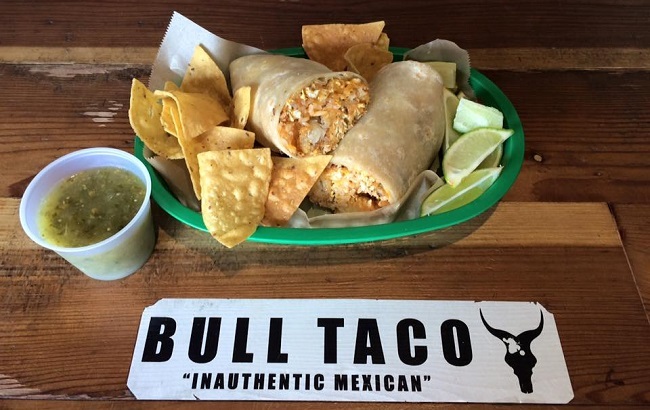 Bull Taco’s food truck on San Elijo beach is the stuff of legend. 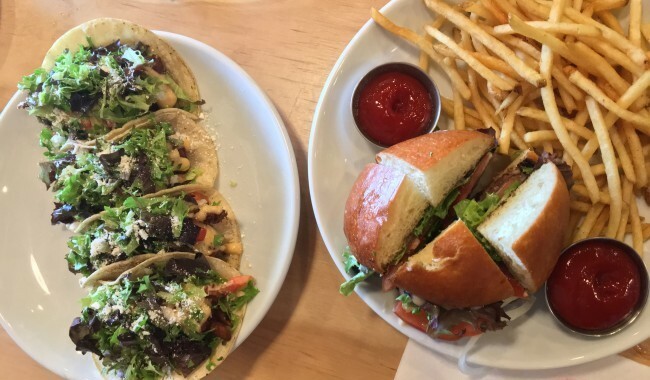 The best tacos in the whole of Encinitas! If sourcing of local ingredients is your thing then look no further than Rimel’s. Their farms ensure that they can raise and grow their own food ethically, sustainably and ecologically. Slow cooked rotisserie chicken melts off the bone and served with two house-made sauces: sweet smoky chipotle mayo and their famous “green sauce” which goes with absolutely everything! 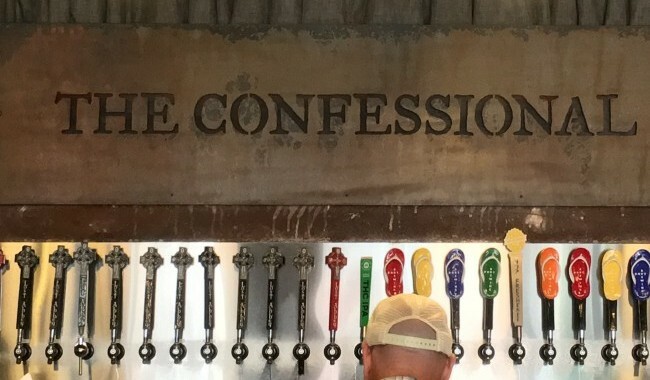 Welcome to The Lost Abbey’s Cardiff tasting room, called “The Confessional”. Worship their local craft beers in pint, half pint, and quarter pint tasting glasses. Assemble a flight of four tasters, sip slowly and contemplatively. The Lost Abbey is for serious beer geeks and not for the novice! Kate Ryan is a food writer, blogger and founder of Flavour.ie a website that is dedicated to promoting West Cork Food through writing, events and tours. 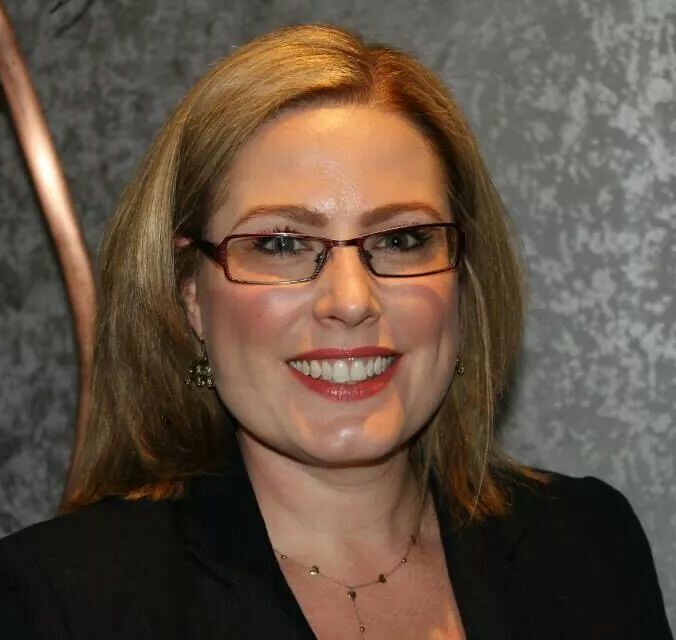 Kate writes regularly for The Opinion Magazine and The Southern Star newspaper and has been featured in the Irish Examiner and Irish Times. Her blog is recipe driven showcasing the best of West Cork produce and encouraging everyday cooking with it at home as well as the best places to eat in the region. Kate hosts a very popular social dining “Supper Club” as well as organising a variety of food-related events getting people to enjoy great local food together. In the summer season, Kate also runs the only guided Walking Food Tour of Clonakilty which takes place every Friday June to August and is accredited by Fáilte Ireland for the Wild Atlantic Way. Kate is also a judge with Blas na hEireann and the Irish Quality Food Awards. Keep up with Kate’s food adventures on flavour.ie, and via her Facebook, Twitter and Instagram pages. Sign up to the Newsletter for previews of upcoming events, exclusive offers and news round-up.